I recently watched the Beauty And The Beast musical in Singapore and my fellow companion hasn’t watched as many musicals as I had the fortune to. It was during the interval when we started discussing the new songs added into the musical and I was telling her that I wasn’t floored by the additional music but that they were not bad. Well, they were certainly not the worst. I also shared with her that one of my favourite songs from a musical was sung in Wicked called For Good. And here’s why. There are people in our lives who leave footprints on our hearts. They impact the way we think and view things. They make us who we are. As recounted in my recent entry reflecting on the film What’s Your Number?, all my past relationships has taught me something about myself and has made me the woman I am today. Perhaps I’m way too optimistic and positive. But why not view past hurts that way? The hurt and injury has been inflicted. Nothing you can do to change that now. Instead of harping on the past negatively, we should all take stock of what has happened, and take comfort in the knowledge that it has helped us become better or at least changed for good. I also like the fact that both Elphaba and Glinda acknowledge that it takes two to clap. While it is possible in some situations that more blame can be assigned to one person over the other, but one can never be too sure what percentage of the blame should be assigned as it’s all a matter or perspective. And everyone’s perspective is unique. It’s amazing how this snippet of the original cast singing For Good gets me all teary eyed. Every thing the song stands for hits me square in the face each time I listen to it. And I feel guilty and relieved all at the same time. Guilt, for hurting someone in my past. Relieved, because despite the fact that I had been hurt before, I have come out of it becoming a better person. 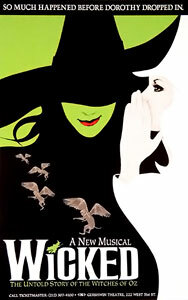 Wicked is a musical you must see if you get the chance. Watching the musical will help you understand this song better and feel the full impact of what the lyrics conveys. However, even on its own, the lyrics are powerful and deserve the time of day.